"These waffles with glazed maple bacon pieces and pumpkin pie spice make a delicious and hearty breakfast." Whisk together the maple syrup, brown sugar, and 1/2 teaspoon pumpkin pie spice. Line a rimmed baking sheet with foil. Place a baking rack on top of the foil and spray generously with non-stick cooking spray. Place bacon slices across the rack making sure to not overlap. Carefully remove the baking sheet from the oven and brush bacon with maple glaze. Return to the oven for another 7 to 8 minutes. Carefully remove the baking sheet from the oven and, using a pair of tongs, flip bacon over. Brush with the maple glaze. Return baking sheet to the oven and bake for another 5 to 7 minutes or until bacon reaches your desired level of crispness. Remove the baking sheet from the oven (last time!) and let the bacon rest for 5 minutes before removing. Roughly chop bacon into bite-size pieces. Reserve 1/4 cup for topping the waffles later. Whisk together the pancake mix, milk, pumpkin, oil, and pumpkin pie spice just until blended. Add bacon and stir to combine. Preheat waffle iron; cook waffles according to manufacturer's instructions. 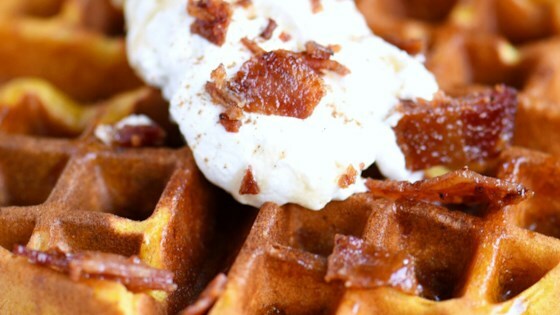 Top waffles with freshly whipped cream, maple bacon, pumpkin pie spice, and maple syrup. Tender, crisp, pumpkin-spiced and ready for dip! If you want to eat at the same time, and who doesn't, when you're done cooking the bacon, reduce the temperature to 250 degrees F. Place cooked waffles in the oven while you finish making the rest. The oven will keep them nice and crisp on the outside! I used a non-stick Belgian waffle maker that doesn't require any greasing. If you have an older waffle maker you will need to spray non-stick spray first.